Most cities the size of Las Vegas (and neighboring Henderson, North Las Vegas and the surrounding suburbs) are filled with traffic that can drive people crazy; however, this is not really a big problem in Las Vegas. While we do have rush hour traffic on some streets and freeways, in general, traffic is very manageable. Most of our city streets in the Las Vegas Valley are new and built on a grid, making it easy for our trucks to navigate the city streets and get where they’re going faster. And, because we have lots of room to grow in the desert, most of our streets are wide, making driving a truck easier (a lot easier than driving a moving van in New York City or San Francisco, for example). Furthermore, the 215 beltway circles the city, so you can jump on and off to get to the other side of town pretty quickly. All in all, driving in Las Vegas is pretty simple and makes our jobs easier. And, time saved in driving, means less time we charge you for your move, so we all win. Because Las Vegas is one of the fastest growing communities in the country, people are used to seeing new faces. While sometimes it seems like a lot of strangers, people are generally happy to find out where you’re from and why you moved to Las Vegas. With so many new people, there are new friends made every day. And, with our pretty laid-back lifestyle, there are many ways to meet people and get to know them. 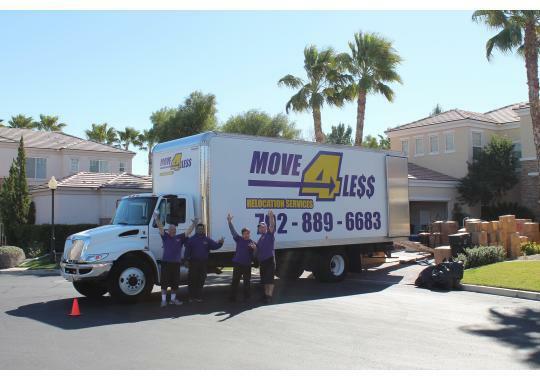 As movers, we service a lot of new Las Vegas residents. We provide a range of services ourselves, to make your move easier, a one-stop-shopping experience. We provide our clients with lots of local information, like a list of contacts for utilities and recommendations for other useful and trusted local service providers. We’re happy to answer questions and find out information you may need (and maybe even recommend our favorite pizza joint for when you’re still unpacking the kitchen). Everyone knows that the Southwest is one of the warmest areas in the country. While it can get pretty hot during the summer, it is a dry heat that most everyone gets used to. It’s also why you’ll see us in shorts a lot! Aside from the hot months, the weather is pretty mild the rest of the year. Since this is a desert, it hardly ever rains or snows, so that’s a lot less mess for movers like us to have to deal with. Without having to shovel snow or cover items from the rain, or getting delayed in traffic because of the weather, we all save a lot of time. This is another way we can make moves more affordable. When people think about moving, they are always concerned about the cost of apartments and houses in their new community. Las Vegas has one of the most affordable housing markets in the country. When people come from parts of the country that are more expensive, they are pleased to see that Las Vegas has so many affordable choices for houses and apartments. There are many diverse neighborhoods, all with their own vibe, lifestyles and amenities. This means that individuals and families, and movers like us who live here too, can make their housing budgets stretch further and enjoy a better quality of life. And, when they find a great new place to live, happy and excited families enjoy the moving experience more, which makes all of us happy! 5. No One Gets Bored in Vegas! When we have time off here in Vegas, we really don’t have to worry about finding something to do. After all, we’re home to one of the world’s favorite entertainment destinations, the Las Vegas Strip. And while we usually leave that busy place to the tourists, it’s still a destination we head to for a show, a great meal, or just to take in the sights with visiting family or friends. Even off the Strip, Vegas is an international city. Today we have tons of restaurants of every sort of cuisine – from small family places to fancy restaurants featuring celebrity chefs. Beyond food, our area is home to some beautiful national parks, including the Grand Canyon, and of course there’s nearby Lake Mead National Recreation Area. And, hey, we just got our very own NHL hockey franchise, the Vegas Golden Knights, and some people are even dreaming about an NFL team of our own. For families, we have an active kids sports scene (soccer is really big here) and our new Smith Center is a great place to experience the Arts, whether you like music, theater or dance. There’s so much to do here, many of us just stay put and enjoy a “staycation” when we have time off! As business owners, one of the reasons we love Nevada is that it’s very easy to have a business here. The state of Nevada has some of the friendliest laws regarding owning and operating a business which keeps our costs down and saves us time, too. While this may not seem important, it’s one thing that lets us keep our prices down for your move and helps us focus more of our energy on doing a better job for our customers. We enjoy working and living here, and especially doing a great job for our Las Vegas customers. After all, we’re locals, too, and we’re very happy about that! Happy New Year 2017 to all our customers past, present and future.